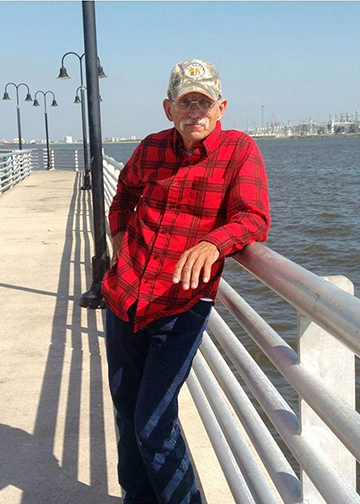 Kyle “Blake” Hanson, 63, of Beaumont passed away on Wednesday, January 30, 2019, at Baptist Hospital. He was born in Port Arthur, Texas, on April 10, 1955, to Katherine Melba Chauvin and Elton Merle Hanson. Blake was a husband, father, son, brother, uncle, nephew, cousin and dear friend. Early in his career, Blake was severely injured while working as a heavy equipment operator. Those injuries forced Blake to give up a career he truly enjoyed. But with his love of the outdoors and his passion for how to properly cut a lawn, he put his energy into establishing Blake’s Lawn Care. Because of his kindness and “Jack of all trades” attitude, he became a “honey doer” for many of his lawn care clients. Blake was a kind and thoughtful person who always found a way to help others. He was a quiet man, but a loud character. He always had a good story and a wonderful sense of humor. Blake is survived by his daughter, Amanda Hanson Francis and her husband, Andre Francis, of Beaumont; his sister, Kay Simon and her husband, John Simon, of Sun City, Arizona; his father-in-law, Jiles “Capt’n” Lindsey of Jasper, Texas; sisters-in-law, Madeline McGallion of Houston, Texas; Melinda Stapleton and her husband, Clint Stapleton, of Jasper, Texas; and numerous family members (aunts, uncle, nieces, nephews, cousins) and wonderful friends. Blake is preceded in death by his wife, Karen Lindsey Hanson; his parents, Katherine Melba Chauvin and Elton Merle Hanson; his brother, Mark Allen Hanson; and his beloved stepfather, Richard “Dad” Parmer. As Blake wanted, his body was willed to The University of Texas Health Science Center in Houston in hopes he could continue to make a difference for others. A memorial service for Blake will be at 2:00 p.m., with a gathering of his family and friends to follow, on Saturday, February 9, 2019, at Broussard's, 2000 McFaddin Avenue, Beaumont. Great friend will be truly missed. Amanda I met you at your mother's funeral and want to express my sincere condolences. Blake and I became friends when my husband was sick and he begin taking care of our lawn. That was about 18 yrs ago and I got to meet your mother when she would ride with him and sit on the patio visiting with me. Blake was a very caring person and good friend. He is finally happy with Karen again who he has missed so much. May God bless and give you peace in the coming days. Amanda, your father was like family to us, That’s how It is when you know someone for over 20 years. I will miss our conversations, his jokes and stories he always told me about you and your mother. I find peace that he is now reunited with your mom and both are in heaven dancing among the angels. Prayers in the coming days and weeks to the entire family as you say your goodbyes to a loving father and brother. May the Lord and His angels bring you peace during this sad, sad time. So very sad to hear of Blake's passing. I'll miss seeing him every other Tuesday, for the past 19 years, at a job he did. I'm so sorry for your loss Amanda, you'll be in my prayers. My condolences on the passing of your father. Praying for your comfort & strength for now and in the days to come! Amanda, I am so sorry for your loss. You are in my thoughts and prayers. Blake was a good friend, and I will miss him so much. Sending our thoughts and prayers to Amanda and the family.